I’m going to start trying to share some more of the books I love reading on my blog, and my first review on here is for an author I really admire, the very lovely Sarah Morgan. I’ve only discovered this writer in the past year or so and have been thoroughly enjoying her Manhattan series. I’m really looking forward to going back and reading some more Sarah’s books – that’s the exciting thing about discovering a ‘new to me’ author that has been writing for a while, and has a backlist to go back and enjoy. However, this review is for the most recent release – Moonlight Over Manhattan. I thoroughly enjoyed it and I think that Harriet might well be my favourite of Sarah Morgan’s heroines. Enjoy the review! 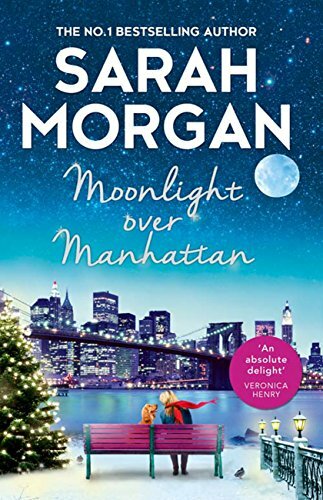 Sarah Morgan has quickly become a favourite of mine and this is the second Christmas book of hers I’ve read this year! Her stories are uplifting, emotional and a wonderful escape from the day. I love the way that you can read many of her latest books as standalones but that they have a thread running through them in that the characters are all connected, even if it’s remotely, to the others so we almost feel like we already know them before we even begin. Moonlight Over Manhattan focuses on Harriet’s story. Harriet Knight runs the dog walking company, The Bark Rangers, with her twin sister Fliss (whose story is told in Holiday In The Hamptons). I absolutely loved Harriet straight away and she’s definitely the type of woman you’d love to be friends with – caring, sweet and can cook a fabulous meal. When a client has a family emergency, she calls Harriet to walk the dog, Madi, who will be staying with the client’s brother. Except that brother, the gorgeous doctor Ethan Black, has absolutely no idea about dogs and when he walks in on the first evening just after Harriet, to see his apartment dog-trashed, his temper sets off Harriet’s stammer, and she leaves, taking the dog with her. I loved how the story developed and at seeing how Ethan’s caring nature helped Harriet’s confidence build over the course of the book. I can’t stand the term ‘journey’ in relation to anything other than travel – but Harriet, and Ethan do both discover more about themselves, and what they’re capable of and that was so fun to experience along with them. I started this book one evening and finished it the next morning, not wanting to put it down! Admittedly, I’ve found this is generally the norm for any Sarah Morgan book! If you’re looking for snow, romance and characters you’d love to know, then be sure to pick up/download a copy of this book. Copyright © 2019 Scribbler Maxi. All Rights Reserved.